- Rigid skimmer basket makes cleaning easy - just empty and rinse with a hose. - Unique weir design improve skimming action and prevents fish from entering skimmer enclosure. - Skimmer enclosure house and hides the pump. 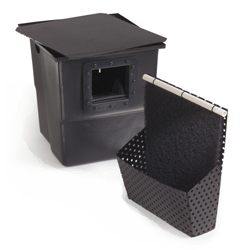 - Extra wide basket and filter mat means less maintenance. - Cross flow design makes pump access and removal easy. - Prefilters water and protects against pump clog-ups and loss of water flow.